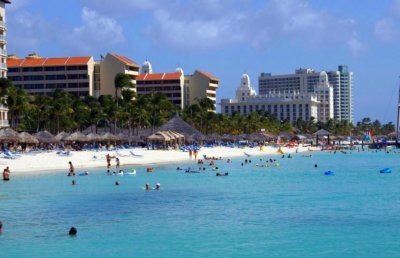 Palm Beach in Aruba is so special because the weather in Aruba is perfect year-round and because of that Aruba is a safe destination of choice for romantic honeymooners or a superb family get-away. And while they’ve pretty much stop building on the tiny island, what is there is breathtaking and delightful; tasteful. Few of us remember Aruba when it had low rise hotels and high rise was anything over three stories. Everyone knew everyone and life was different. Oh, but still go. It’s a fantastic experience even if you have to wait a few more seconds at the stop light or walk around an elderly couple looking over cigars in a display box on the main drag through Oranjestad. Palm Beach is so called because of the palms that line the edge of the beach that meets the rocky but flat terra firme. There are a few that remain but we kinda miss the old vista of the palms. Today, a few huge mega-resorts line the once mega-beach. Sounds like we’re complaining and with progress comes places to lodge people. Yes, you will enjoy the beach here – it’s that big. Our suggestion as always on Aruba has been to rent a small car for your entire stay. You’ll need it to get to the various beaches and restaurants. And we love exploring – you’ll want to use it for seeing what is happening on the north shore. And at Palm Beach, Aruba, you will find great parking – but after 10 AM it can get crowded. The hotels let you park in their lots, since they hope you’ll come in and sit at their casinos for a spell. So remember you can walk through and go right out onto the beach – and very easily use their facilities throughout the day. Since there are no beaches down by the center of Oranjestad where the cruise ships come in, they ferry and drive their passengers down to Palm Beach. This can mean a crowded beach for you, even though this beach is quite large. And the way the hotels and shops have lined the beach, it may remind you of other boardwalk style destinations. Just a gentle reminder that although Palm Beach is fun and overall clean, it isn’t the best beach on Aruba. Of course – beaches are debatable. But what would take Palm off our list is the fact that there has been some fill in over rock is some areas – so use caution. And in addition, with the cruise ship traffic you will have the local vendors scurrying to make a business out of jetskis, motorboats, snorkel cruises, all leaving and traversing the area. If you’re here with family, you’re in for a treat, because this is the perfect family beach. The way the shoreline slopes out so gently the water is quite shallow for a distance from shore. The water is warm closer to shore and the sand is almost white. The only complaint we hear from time to time about Palm Beach in Aruba is the amount of seaweed that comes on shore and is a little messy to deal with. Other than that, the government and hotel association does an excellent job of keeping this area clean. Would you please send out some travel information?